Snow white, snow bright — I think Snow is quite alright! 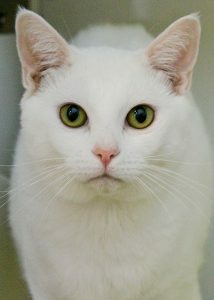 I am Snow, the sweetest 9-month-old boy kitty who is looking for a quiet and loving home that I can cozy up in. When I first came in, I was pretty bashful and unsure about new people. Now that I’ve been here a little while, I’m learning that Pixie is a really nice place to be, and I’ve really opened up to show my how utterly adoring I am. I will usually purr as soon as someone reaches in to pet me and I’m coming out more and more to play and interact with new people. 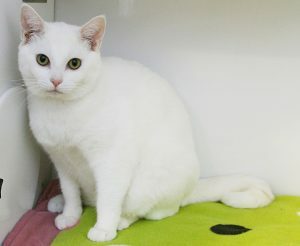 I’m a very rolly-poly boy with soft, thick fur that resembles a fresh blanket of snow — hence my name! Even though I’m young and definitely have a playful side, I’m overall very mellow for my age and will probably do best in a quieter home without too much activity. I grew up with other cats around and could probably acclimate to a home with other animals and respectful children as long as I was given enough time to gain my confidence in a new environment, just like I’ve done here at the shelter. Looking for a perfect kitty for “chill” time at home? I think I’m your guy! Stop by Pixie today and say hello! I come to you neutered, vaccinated, and micro-chipped for an adoption fee of $100.